The distribution of reproductive success within societies is a key determinant of the outcomes of social evolution. Attempts to explain social diversity, therefore, require that we quantify reproductive skews and identify the mechanisms that generate them. Here, we address this priority using life history and genotypic data from >600 individuals in 40 wild groups of the cooperatively breeding white-browed sparrow weaver, Plocepasser mahali. We show that groups comprise up to six males and seven females, but within-group reproduction is completely monopolised by a single dominant male and female, while extra-group males sire 12–18 % of offspring. Strong within-group kin structure could frequently explain these monopolies, as subordinates had typically delayed dispersal from their natal groups and so frequently (1) lacked within-group outbreeding partners, and/or (2) stood to gain little from contesting dominant reproduction, being almost as related to the dominant’s young as they would have been to their own. Kin structure alone cannot account entirely for these monopolies, however, as they remained complete following the immigration of unrelated males and females. 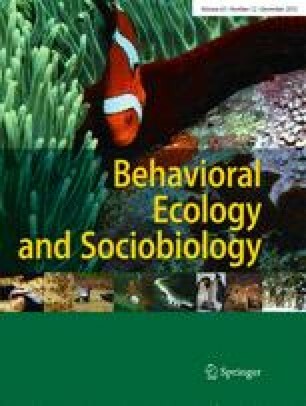 That subordinate females remain reproductively quiescent despite also showing comparable body condition to dominants, overlapping them substantially in age, and showing no evidence of elevated stress hormone levels raises the possibility that they exercise reproductive restraint due instead to a threat of action by dominants and/or deficits in offspring fitness that might arise if subordinates bred. Our findings highlight the complexity of the mechanisms that generate reproductive disparities in animal societies and the challenge of identifying them when skews are complete. The online version of this article (doi: 10.1007/s00265-013-1599-1) contains supplementary material, which is available to authorized users. We are grateful to our many field assistants during this period (Tom Reed, Brenna Boyle, Andy Mason, Francesca Jarero, Lexy Russell, Padraig Cregg, Lynda Casson, Sam Farrell, Lynda Donaldson, Jenny Sturgeon, and Robyn Silcock) for their tireless efforts under the Kalahari sun, to Northern Cape Conservation for permission to conduct the research, and to E.O. and Son and all at Tswalu Kalahari Reserve for their exceptional logistical support. We thank two anonymous reviewers for helpful comments that improved an earlier draft of this manuscript. This study was funded by a BBSRC David Phillips research fellowship to AY and a NERC blue skies research fellowship to AY. All protocols were approved by the University of Pretoria ethics committee and complied with regulations stipulated in the Guidelines for the use of Animals in Research and complied with the current laws of the Republic of South Africa.